Meet our new Fylde LOVEmyBEACH Officer Emily! 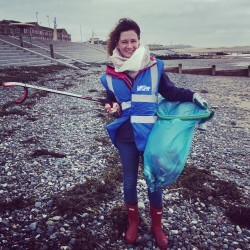 With Emma moving on to pastures new, Emily is very excited to join the team as she has grown up on the Fylde coast and has been a regular volunteer on our beach cleans for the last few years. She learnt to scuba dive in the beautiful waters of Thailand and has been completely in love with the ocean ever since! She was lucky enough to live on a remote beach in Mexico for a few months, monitoring the health of the coral reef every day. Emily ran weekly beach cleans there, although they were much warmer than those on the Fylde Coast! Some of our volunteers will already recognise Emily as she has been working on the Fylde Coast for the last 18 months, delivering Lancashire Wildlife Trust’s marine project. She is over the moon to be joining LOVEmyBEACH, to help spread the message about how we can all help protect our beautiful local beaches and sea. Be sure to say hello if you see her out and about on the beach! Cleaner Seas in the North West! 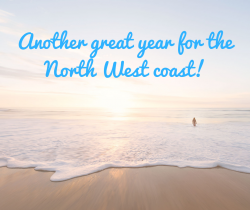 No matter whether you enjoy a swim, paddle or stroll along one of the region’s beautiful beaches, you can rest assured that the North West has some of the cleanest bathing waters in the UK. The Department for Environment, Food and Rural Affairs (Defra) has published statistics that reveal that 97% of the North West’s bathing waters meet the government’s required standards for water quality. 10 are Excellent – the highest, cleanest class and the required standard to quality for Blue Flag status; 16 are Good – generally good water quality; 3 are Sufficient – the water meets minimum standard and 1 is Poor. You can check the water quality for your nearest beach by using our map feature. One of the highlights from this year’s results is on Walney Island, where two bathing water sites have improved on their classification. Both Sandy Gap and West Shore have achieved Good status, an excellent boost for Cumbria’s coastline. All bathing waters on the Sefton and Wirral coast are rated either Good or Excellent, and so are the only fresh water sites in the region. All four bathing locations on Lake Windermere are, once again, rated Excellent. A range of stakeholders have contributed to reducing pollution and improving the regions rivers, lakes and the sea, including the Environment Agency, United Utilities and the local authorities. 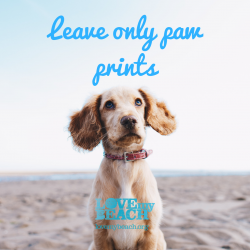 Additionally, hundreds of residents from across the North West have engaged with LOVEmyBEACH; acting on advice related to what not to flush and picking up after their dogs at the beach. Even though lots of good work has already been done, there’s still more to do. Why not see how you can help our coastline from the comfort of your own home by making simple, easy changes or come along and enjoy the scenery by taking part in a beach clean. LOVEmyBEACH is supporting the latest #binit4beaches campaign. We’re asking all dog owners who love to take their pooch for a walk on the beach, to pledge to always pick up their poo! It’s not the most glamorous job in the world but it has to be done. Just one gram of dog poo is enough to affect the quality of more than one million litres of seawater. Dog faeces contain lots of harmful bacteria that can cause problems for both humans and wildlife. It can mean health problems, such as eye/ear infections and upset tummies for bathers and paddlers that come into contact with contaminated water. But why not just let the tide wash it away? Unfortunately dog poo doesn’t just disappear when it comes into contact with the sea, it dissolves and the bacteria will keep on hanging around in the shallow waters – exactly where people like to paddle. Protect other beach users by being a responsible owner and clearing up your dog’s mess. So, make sure you know your poos and don’ts! Always pick up your dog’s poo at the beach (and everywhere else!) and make sure the bag goes in the bin. Leaving poo bags hanging from trees and bushes or just on the floor adds plastic pollution into the mix – something we definitely need to avoid.